Pop the Cork – It’s a New Year! Happy New Year! The Weekend Winos wish you a year full of health, happiness, good food and libations! The group agreed that at our first gathering of 2014 we would share a bottle of champagne that we enjoyed during the Holidays. What a treat! The only disappointment was that some of the winos were still traveling and could not join the tasting. 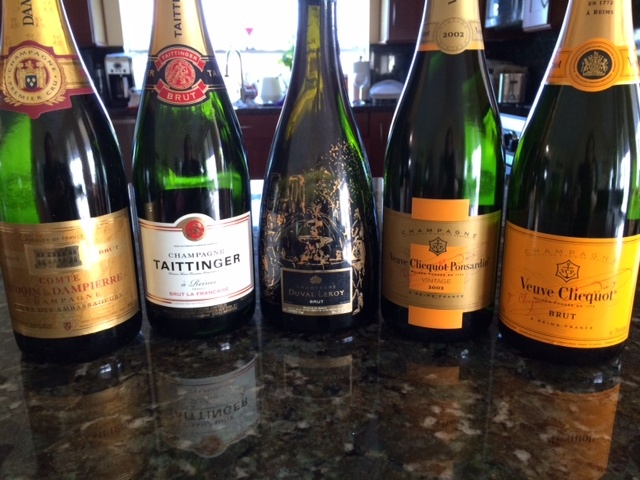 Of the five champagnes we tasted, only one was vintage. Vintage champagnes are produced from grapes grown during that specific year, and usually it is a very good season. The process is also longer, vintage champagnes have a minimum of three years’ aging which is typically just the minimum as most are aged for a longer period. The result is usually more complex, layered flavors than its nonvintage counterparts and also a champagne that you can keep in your cellar for longer. Veuve Cliquot Ponsardin Vintage 2002: A notable difference from the nonvintage bottle. Light in color with a hint of citrus. Duval-Leroy Design Paris Brut: The silk-sceened bottle, signed by LeRoy Neiman, is a work of art and set the tone for the overall experience. Gold in color, dry with delicate fine bubbles. Comte Audoin de Dampierre Ambassadeurs Brut: We learned that this champagne is served at embassies around the world, as well as presidential and royal receptions. Elegant and delicate it was perfectly balanced and so easy to enjoy. This is the start of a new tradition that I am confident the group will repeat every year. Categories: Champagne | Tags: Champagne, Comte Audoin de Dampierre Ambassadeurs Brut, Duval-Leroy Design Paris Brut, Veuve Cliquot Ponsardin Vintage 2002, vintage champagne | Permalink.